It was never the plan to cycle in Thailand. Because of borders, visa and because travel plans change we made it here anyway. We are in Mae Sot now contemplating our time in Thailand from the expected ease to the little more unexpected possibilities to get off the beaten track in this well developed country. Lately we cycled from Chiang Mai to Mae Sot along Borderlands and hill tribes, last but not least hard pedaling up these Northern Thailand hills. Chiang Mai was the place for us to rest and this we did. A BIG thanks to Katie and Jared for hosting and partying (as cycle tourist do 🙂 ). As you know we had to go home in December for the family. Martin’s mother passed away due to cancer. This was a hard period of the journey which gave life a new dimension and our journey is now even more important to us. As a small token we took the opportunity to stay for Christmas and a short trip to the Netherlands which was really really nice and gave some light in a rather dark time. 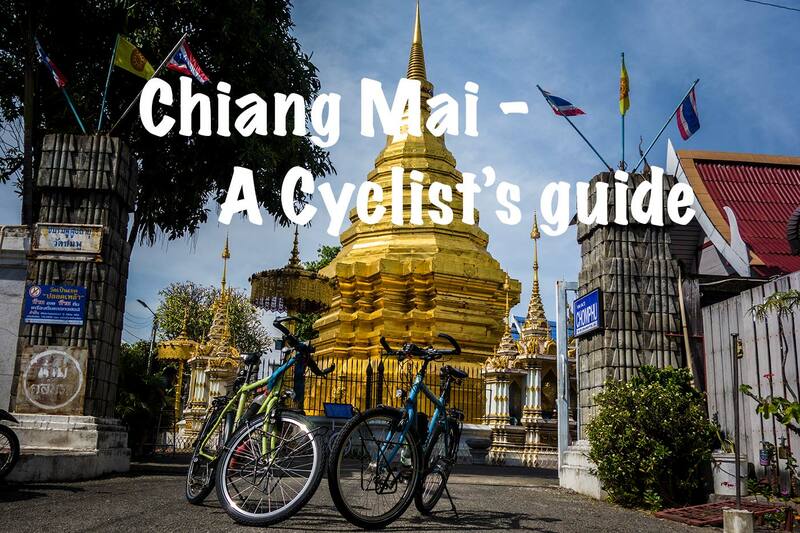 The cycling south east out of Chiang Mai was uneventful and maybe boring but we were still excited to being back on the road so that didn’t matter. We had an idea that there would be guesthouses in every town out of Chiang Mai following the Mae Hong Son route eastwards. This is almost true just not in Ban Chomthong. We only found a scruffy looking room for 300Baht so we went in search for a spot for the tent. We went to the next temple and asked and they politely showed us the road back to the town 🙂 Took a small road and found an orchard great spot and enjoyed being back in the tent. We had actually missed the camping more that we realised and the routine of an early evening and waking up with the sun, it is so so great. We had packed up the next morning and were on the road to the town Hot when we saw two cyclists packed for a long trip. We cycled over to chat as they were going the opposite direction. 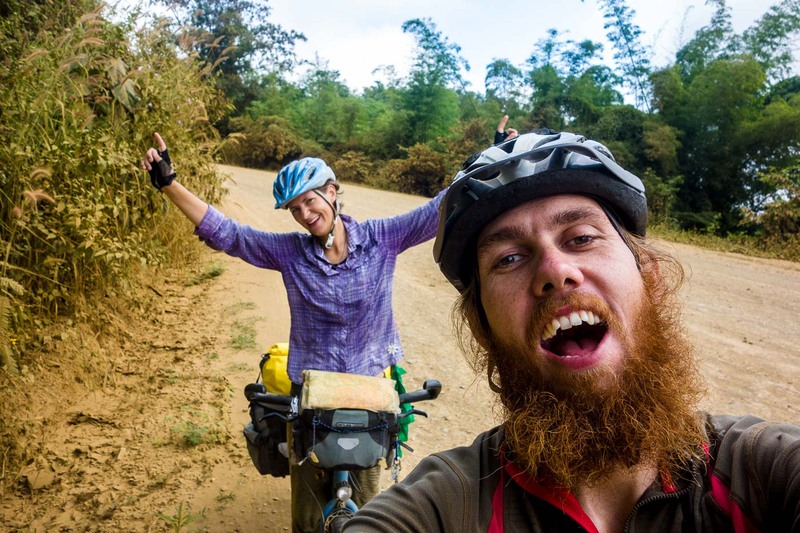 We all said hello and then Joris said “Are you TwistingSpokes?” then we all had a laugh and they already knew our story so we could skip that introduction 🙂 Joris and Elien are on a journey of their own by bicycle, have a look a their stories at www.schwenkk.com (Dutch only). This small meeting gave us more energy than we thought a small talk could give. We were high on stories and felt great as we cycled in to Hot for an early lunch. We knew it was time and time it was. The great hills of Northern Thailand hit us again front on! We made it up into the Ob Luang national park and had a quick snack before the tea shop closed at the entrance of the park. We cycled on for a bit and found a wonderful spot on the mountain, flat and perfect for the tent. Yet another great evening with our tent and a clear sky filled with the stars. By the way we slept as a rock as we were done after the climbing of the hills. The people had changed and their clothing was different too, hill tribes still exist in these regions and they set up stalls along the road to sell their crops. We enjoyed another day of going up and down on the steep hills before we reached Mea Sariang a nice town next to the river. We stayed a day to relax and enjoy the different feel of the place. We had a room on the river bank with a great sunset lookout. The Good View Guesthouse lived up to its name. Susanne didn’t feel great in the morning but we decided to hit the road anyway and see how it would work out…. at the 30km mark we stopped as Susanne was getting ill so we took some rest and from there it was clear we needed to find a place to stay. Susanne was sick from a stomach bug and fever was there and thronging up. We found a ride back to the Good View in Mae Sariang and stayed till Susanne got better after 3 days. Martin got to ride Mojo in the surrounding Salawin national park and enjoyed the ham and cheese toasts from 7/11. Take 2 on the road to Mae Sot, we decided to cycle the 30km again and this time the km’s flew by and Susanne felt a great deal better. We had a nice fried rice for lunch before the hills would take their toll on us. We could see a small levelled out area on the plot of the GPS so we decided we would cycle up to that part of the hill and find a spot for the tent. This was a good idea only to find steep hill sides and no spot for the tent… Yes we have thought of a hammock but never really went for it so we stick to our tent and a flat spot. It was getting close to sunset and we were still in the hills. Martin searched for the spot and Susanne was getting tired. Martin came down from a track in the hills and said: “I think I’ve found a great spot, we just need to climb a bit” and that we did. First the panniers and then Mojo and Isaba. Indeed it was the perfect spot on top of a hill where the jungle had been cleared. Our last camp spot in Thailand goes into the book as one of the finest camp spots on the journey. The morning was spectacular as we woke up with the sun rising and the clouds below us, wow it was so beautiful! We were filled with a great feeling of belonging and being there with the nature. We had some more steep hills to enjoy on top of the mountain with some roadworks. Cycling through small villages with hill tribes and through national parks meant a really nice ride. It was a tough day. Many of the steep passages were very steep and a lot of up and down, but the very slow pace gives a way of understanding the place more. It gives respect to the people living on top of these mountain who go around their business everyday up the mountain and down the mountain, in their hilly fields and with mainly their own resources. Lately we have been talking quite a lot among ourselves about pace, about the need to cycle, about how to travel a journey like this. Many times it is easier to take a bus or hitch hike up the next hill or to the next place. But why travel by bicycle if you are not going to cycle the hard parts? How do you know you are not going to miss the best encounter or see the most beautiful road? Who remembers the easy? 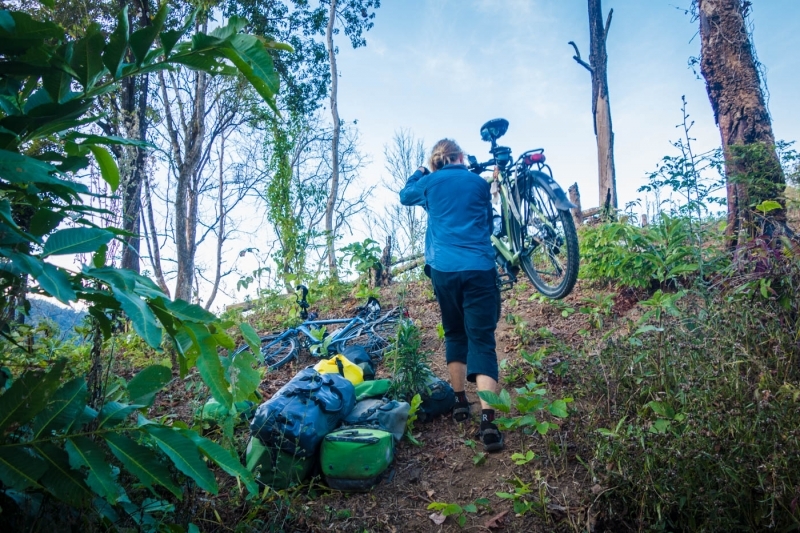 We love the freedom the bicycle brings and especially the possibility of camping where we want to at the end of the day not ‘needing’ to find a room but having our own little home and are happy Thailand gave us some great little camp spots since Chiang Mai 🙂 . We had decided to push on to Mae Salit for a guest house there and just a few kilometres before the town, we met Harvey an American working at a school nearby. We talked about the situation of the area and he invited us to camp at the school grounds if we wanted, this time we declined and he gave us advice to find a guest house in town. Reaching the river Moei was another milestone for us as this is the border between Thailand and Myanmar which we would follow all the way to Mae sot around 150km. This area is largely populated by Karen people, they live on both sides of the river. In Myanmar their existence has been difficult and torn by conflicts. Many have fled to Thailand and some have created a life on both sides of the border. We know little of the place but could definitely feel a different culture here as we cycled through the rural villages. Mae La a refugee camp with more than 60.000 people living there exists since 30 years and is on the border between Thailand and Myanmar. We cycled along this camp and it made a big impression on us. People are born and raised in the camp and have little future outside this camp. There is so much to be said about people but this idea that we cannot accept each other and live in respect is maybe what is the biggest killer of human kind. We have no words to describe our feelings and there is no apparent solution. We do know that our journey has opened our mind to so many cultures and we are proud of a world with so much to offer. Humans can live in respect of each other! With all these thoughts we continued and reached the town Mae Ramat where we stayed for the night. It was a mere 37km to Mae Sot where we will cross in to Myanmar. Here we sit right now and prepare for the next country Myanmar. This journey of around 2000km through the country of many smiles, we have heard. As we had arrived in Mae Sot we got a message from Mo a guy cycling as well. We had met in Turkey before Ankara, back then we were just a few months in and he on his way home from China for 10 months. He would arrive this afternoon in Mae Sot so we arranged to meet and we had a nice evening sharing stories.